Find Better Ideas, Faster ® with a custom man cave trend report, our PRO Dashboard and 80+ categories of premium trend reports. The male-centric Man Cave Trend Report looks toward the trend of specially tailored spaces designed for male sensibilities. 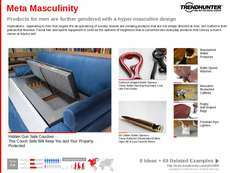 Often featuring specific decor, entertainment and furniture, the typical man cave is an area separate from the rest of a home, and each is customized to the specific tastes of the user. Our report explores exciting trends and designs for different man caves, and also looks at a variety of consumer products made specifically with the idea of a man cave in mind. This report features a number of exciting examples of man cave designs, decorations and interesting products that can help inspire those looking to create their very own man cave for a client, or one just to call their own. Product designers, marketers and retailers targeting male demographics will also gain useful insights through this detailed report. Trend Hunter's Man Cave Report has everything needed to help inspire the next great man cave with its collection of trends, products and designs.